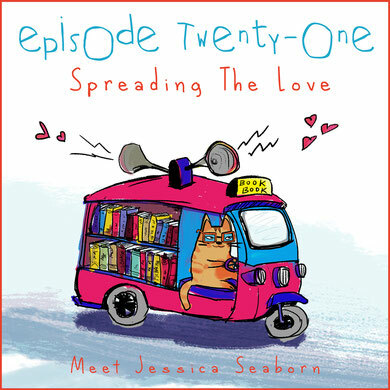 This episode celebrates some of our favourite people on the planet – Teacher Librarians! Meet three inspiring TLs, Megan Daley, Lizzy Martin and Louise Brooks and get the lowdown on school libraries! This time, we’re celebrating first independent reads – the wonderful world of junior fiction! Meet series queen Chrissie Perry, and in Kids Capers hear from kids on their favourite first novels. In this episode, meet picture book rhymer extraordinaire, Chrissie Krebs! Discover her top tips for writing in rhyme, and in Kids Capers, some young listeners create a fun rhyming story of their own. Shhh...artist at work! Join us as we chat to illustrator and art director, Sarah Davis, and speak to some young artists who won the Wombat Books’ illustration challenge! 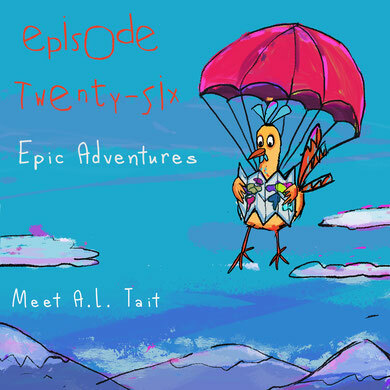 Join us on an epic adventure with middle grade author A.L. Tait. And in Kids Capers, we hear about an adventurous new kids’ book app called AudioPlay! 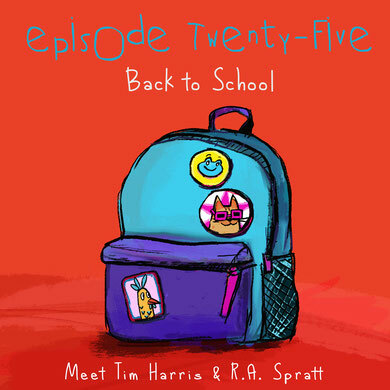 Head back to school with author Tim Harris, as we chat schools in books and all things Mr Bambuckle. And in Kids Capers, a young superfan interviews R.A. Spratt! In our first episode for 2019, meet Justin Monjo, the screenwriter behind the new Storm Boy film. And some avid young readers pick the books they’d love to see on the big screen. 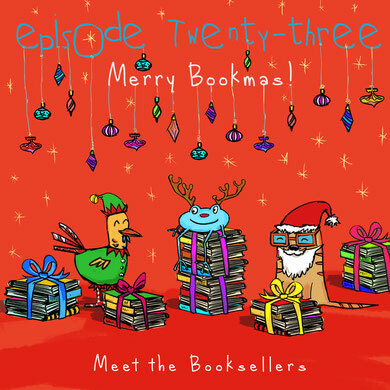 Join us for festive bookish fun and our final episode of the year! Hear the must-read kids’ books from Readings Kids, Where the Wild Things Are & The Children’s Bookshop. 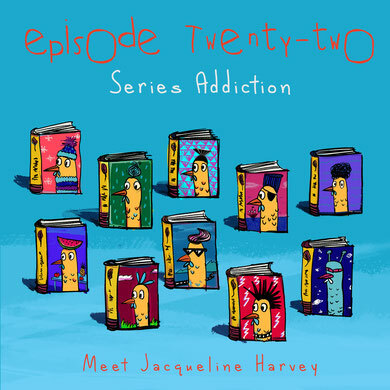 Meet the author of some of Australia’s most beloved kids’ book series, Jacqueline Harvey. And in Kids Capers, let some savvy students convince you to read their favourite series! Join us as we spread the love for authors, teacher librarians and BOOKS! Meet Allen & Unwin publicist Jess Seaborn and young INKY Awards judge Luca. Pop on your Halloween costume, it’s trick or treat time! Join us as we doorknock some favourite authors, meet Wyrd author Cate Whittle and perform the winning piece from our kids’ spooky story comp! 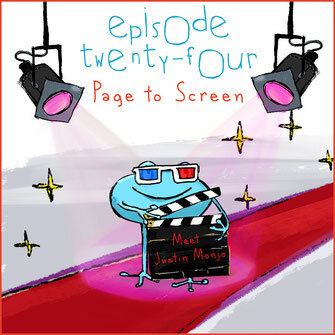 There's A Hippopotamus On Our Podcast Eating Cake! Meet author Hazel Edwards! And in Kids Capers, discover a talented teen with her own book publishing business. In this episode, we’re unpacking the power of story with author, literacy advocate, SCBWI leader Susanne Gervay. And in Kids Capers, we hear from the kids about stories that have changed their lives. This episode is all about audio books! 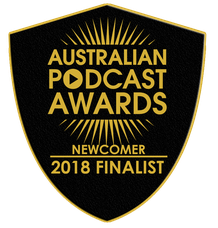 We chat to the CEO of Bolinda Audio, Rebecca Herrmann, as well as narrator Stig Wemyss who also narrates the winning story in our recent kids’ writing comp! Join us for a celebration of Australia’s talented Indigenous authors and illustrators, as we meet Rachel Bin Salleh of Magabala Books and storyteller/artist Gregg Dreise. Get your costume on, it’s the best time of the year – Book Week! Go behind the scenes with the CBCA’s Gail Erskine, and we chat to the legendary Paul Jennings! Meet scientist and kids’ book author Idan Ben-Barak, and hear more about his fun look at microbes, Do Not Lick This Book. And in Kids Capers, some clever kids create their own experimental story mash-ups. Meet picture book illustrator Gwynneth Jones, one half of the Finding Granny team (the other being our very own Kate Simpson!). Find out more about their collaboration, and in Kids Capers, go behind the scenes at the Sydney Opera House when kids meet the cast of Hunting of the Snark. Get the inside word on the fabulous CYA Conference, an annual gathering of kids’ book writers, illustrators and publishers in Brisbane. We chat to prolific picture book author Claire Saxby, CYA competition winners, conference founder Tina Clark and more, in our first ever event special! The Children’s Bookshop in Sydney. Meet one of the funniest kids' authors around, recent Children's Laureate, and importantly, the brains behind Mr Chicken - the one and only Leigh Hobbs! We also chat to a group of kids to discover what books are tickling their funny bones right now. Join us on a trip through the solar system with picture book author Shelly Unwin, as we hear all about her new book, Blast Off! And in Kids Capers, Nat and her kooky crew get their acting on, performing space-themed stories written by some talented primary school kids from Melbourne. Meet hilarious kids' book author, Oliver Phommavanh. We talk food in kids’ books and his love of burgers and video games! And in Kids Capers, we hear directly from kids about their favourite bookish food scenes. Peek behind the publishing scenes with Anna McFarlane, children’s publisher at Allen & Unwin. And in Kids Capers, 9-year-old Zara gets the illustration lowdown from Jules Faber of Weirdo fame. Meet one of our favourite Australian literary legends, Deb Abela, as we chat about her writing journey, awards and second spelling bee book. And in Kids Capers, three young readers review your hosts’ favourite childhood reads. Meet picture book author Jess Walton, a fierce advocate for all kids being able to see themselves in books. Hear book recommendations from a wonderful bunch of kids, and enter our latest giveaway to win two A.L. Tait books! Get the lowdown on libraries! Meet Bethany Macdonald from The State Library of Victoria and discover what’s hot at story time, plus hear from some of the Alphabet Soup mag’s youngest book reviewers! Dive into the world of illustration in Episode 2 of One More Page! Meet illustrator Nicky Johnston, hear kids turn into their favourite book characters, win a cartooning workshop and more! Internal age: A thousand lifetimes. Secret superpower: Spreadsheets and lists. If you need to be saved from a burning building, call Wonder Woman. If you need to a five year plan with budget estimates and maybe a Gantt chart, I’m your gal. Obsessed with: Writing. Seriously. It's my thing and I hope to do it every day of my life. Bookshelf style: Bookshelf is kind of a loose word in my house - does a huge pile on the floor by my bed count as a bookshelf? What you wanted to be when you grew up: A microbiologist specialising in viruses. What you got in trouble for at school: Usually, not a lot, but I could sometimes be kind of rude without even meaning to be (I was totally misunderstood!). Favourite books as a kid: Anything by Enid Blyton. When I was a bit older, I loved John Marsden’s books: So Much to Tell You, Letters from the Inside and of course the Tomorrow, When the War Began series. And now: I discovered Little Women and Anne of Green Gables when I was in high school and they're now more than books to me. They’re friends. What you got in trouble for at school: Laughing attacks (in the library, of all places). And now: Hmmmm, kinda the above plus Star Girl, Roof Toppers and The Hat Trilogy.